For those of you who are newbies to Jang Keun Suk World, when he performed in Daebak (aka Jackpot or The Royal Gambler) for SBS, the PD wrote and posted wonderful PD Notes. They were an absolute treat! 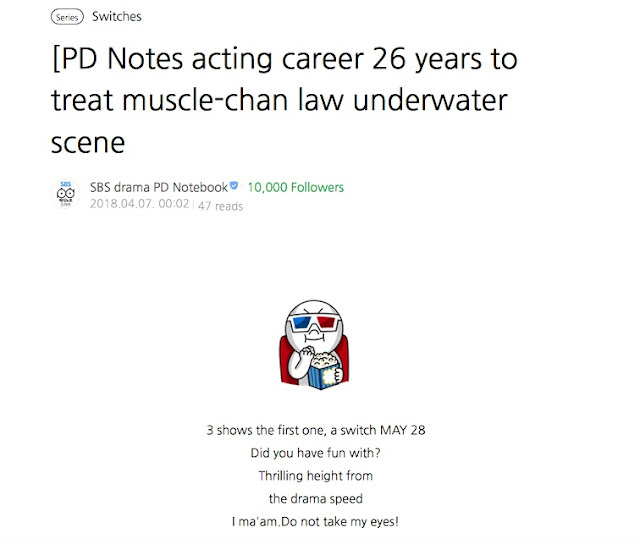 So, of course, all of us who watched that drama now want to read all the PD Notes for Switch. You can find all the PD Notes on the SBS Switch web page. The latest Switch PD Note discusses JKS' underwater scene when Baek Jun Su's car goes crashing into the sea after a dump truck purposely hits it in a blatant attempt to murder Baek Jun Su. The PD notes that only an actor with 26 years of acting experience could have pulled off that scene...because that actor understood what it takes, both physically and mentally, to accomplish it. And Jang Keun Suk did. He worked long hours (three hours in cold water, risking hypothermia - dangerously low body temperature) and physical exhaustion to film the scene as realistically as possible. In addition, the PD Note shows how the scene was filmed...and Jang Keun Suk actively involved in discussing the scene with the PD in order to film it perfectly. To make sure nothing untoward happened to Jang Keun Suk, a professional underwater team and a security team were deployed to make sure the scene went off as planned without any major danger to Jang Keun Suk. Throughout the arduous filming process, Jang maintained his smile and humor...which the PD notes, "So, it was a birth of a legend to escape in the scene!" Yes, Jang Keun Suk - the legend!!! Finally, the PD notes that "Beyond the Hallyu star, Jang secured his position as an actor with this scene." Click here to read the PD Note for yourself and watch all the included video clips.